Monte Wolverton was raised by Wolvertons in the Pacific North West. He is the cartoonist son of cartoonist Basil Wolverton. He is known for his political cartoons and his satirical contributions to Mad Magazine. Monte Wolverton is also an associate editor and board member of Plain Truth Ministries, a publishing and teaching ministry committed to proclaiming ‘Christianity without Religion.’ In The Remnant, Wolverton imagines a world where “the apocalypse came and went and Jesus didn’t return along with it”(268). So this is Christian fiction with a healthy overlay of seventies-style-dystopia science fiction. In 2131, the world is ruled by an atheistic, totalitarian regime based in Carthage, Tunisia. The few Christians and people of faith in the safe zones are sent to work camps far away from the general population. Outside the safe zones, is the wilderness—vast regions more or less free from the Federation’s direct control. Grant Cochrin is a geologist imprisoned in a work camp in North Dakota (probably working on a pipeline). He is a Christian, and has a single page from the Sermon of the Mount (Matt 5-7), a remnant page of the family Bible (the Bibles had all seized and destroyed by the government). After Grant has a chance encounter with a wilderness dweller, he learns about Christian communities in the wilderness. He, his family and friends escape the camp, and chase after the promise of religious freedom and authentic Christian community. However, their post-religious-context means the groups they encounter have tenuous grasps on historic Christian faith and practice. They meet profiteering prophets, legalistic faith healers, Charismatics that do drugs during communion (and then cavort), and catholic monastics who are way too into their shrines and spiritual disciplines. And they encounter a few helpful voices as well: kind strangers who take them in and help them on their way, fellow Christians who join their quest, friendly Muslims and Buddhists (who reunite Grant with the Bible his page remnant was from), an elderly religious scholar who tries to get Grant and his group to look at what they already have as community instead of looking elsewhere, and even helpful Raptors (Mad Max style motorcycle gangs who control everything in the wilderness). They face perilous dangers along the way, and in the end Grant is forced to make a major decision. I don’t review a lot of (self consciously) Christian fiction because of the tendency of their authors to tell instead of show. The medium is merely a vehicle for the message and the literary craft falls flat. If I want preachy prose, I’d rather just read John Piper (or someone else more Reformed than God). Wolverton is guilty of way too much tell, and not enough show in his writing. The whole book is designed to promote the Plain Truth’s Ministries idea of “Christianity without religion.” It has a sermonic quality (here is another group that gets it wrong, how can we be faithful to the gospel). Grant says near the end of the book, “If there is anything I’ve learned on this trip,” Said Grant,”I’d have to say that Christianity functions poorly as a religion. It is most healthy when it’s an active trust in Christ—a friendship in which he leads, obviously, since he’s our Shepherd” (240). This is the message the entire story tries to illustrate and hints at along the way. So I can’t say this was great literature or anything. However the book held my interest. There is some playful, humorous dialog. I kept reading to see what kind of religious nutjobs Grant and the team would encounter next. For mindless fiction, the book was alright, and well paced. I give it three stars. Note: I received this book via Speakeasy in exchange for my honest review. Okay, not really seedy though a ‘seed’ (and later seeds) feature prominently in the narrative. Erik Guzman‘s The Seed: a True Myth Retold recasts the story of humanity’s fall and redemption in fantasy-novel form. The story begins wih Tatus, a hunter chasing the shadow that took his wife and children’s lives. Wyrm, a serpentine dragon takes him down, but then apparently heals him by infesting him with dark-maggot-like worms. When we next meet Tatus, his wounds heal and he is now an apparent devotee to God, unafraid of the shadow and still plotting its demise. He meets a woman and a man, which he names Madeline and Roark (they didn’t remember their names) and enlists their help in building a labyrinth which will trap the evil shadow forever. Madeline lives in the tower at the center, where she is isolated from Roark who is continually building and extending the labyrinth’s outer walls. Roark is an addict, lonely and angry. Madeline is afraid. The Wyrm in Tatus’s eyes feeds on their fear and anger. [Spoilers, kind of] Eventually love breaks free, setting Roark and Madeline free from their isolation and re-christening them with new names. They live as tree people with roots in their feet that drink deep from Nali, the water of life. Love imprisons Wyrm and enlists Roark and Madeline (now Ruak and Madria) to defeat the dragon. They fail and their doubt and mistrust causes them to fall back under Wyrm’s control. Love seed Ilan is given as a gift to the woman, setting her free once more and causing Ilan (Love’s Son) to take on physical form as a personified tree. This sets the stage for a final confrontation with Wyrm. Guzman, who is co-host of Steve Brown, Etc., has spun an imaginative tale making use of the biblical fall, and the Triune God’s plan of redemption. This is an allegory and myth, making heavy use of symbol and names. It is imaginative, though not always particularly easy to follow. Each of the human characters is given at least two names (Madeline/Raven/Madria, Roark/Ruak, Tatus/Erik) through out the narrative. I enjoyed the book but it took me a while to get into the story. The labyrinth construction of a self-imposed prison was too bald of a symbol for me, making too obvious the point that Guzman was making from the get-go. But hey, it is an allegory, so that is kind of part of the genre. Eventually the threads weave together for a compelling narrative. What I did appreciate was the theological and psychological insights that Guzman used in crafting the narrative. So I give this book 3.5 stars and recommend it as a tale that makes vivid some biblical truths about the nature of sin, God’s love for us and our redemption. Note: I received this book from Speak Easy in exchange for my honest review. The Shack was a literary phenomenon inspiring a whole slew of theological reflections on blogs, in articles and in full length monographs. Books like Finding God in the Shack by Roger Olson, or Finding God in the Shack (what can I say, catchy title!) by Randal Rauser read Young’s novel with a sympathetic eye affirming much of its content. Others are more scathing in their critiques (see for example James DeYoung’s Burning Down the Shack). 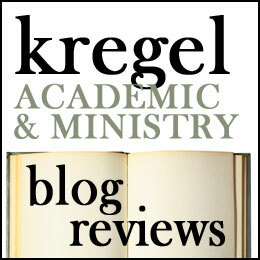 What sets C. Baxter Kruger’s The Shack Revisited apart is his glowing endorsement of The Shack’s overall theological vision (the other authors above each register points of critique). As a friend of William Paul Young and an early endorser of the novel, he describes the emotions he felt when first reading it in a deer stand while hunting. Kruger was overcome by Young’s depiction of the Triune God and the way He (She? They?) dealt with the brokenness of Mackenzie (Young’s protagonist). Young himself writes the forward and commends it to all who read and valued The Shack, “If you want to understand better the perspectives and theology that frame The Shack, this book is for you (ix).” This makes C. Baxter Kruger the author-approved theological interpreter for his book. Kruger is no theological-light-weight. He has a Ph.D in philosophy from Kings College, Aberdeen where he studied theology under James Torrance. He has also written influential books of his own on Trinitarian theology. However, he has chosen to use his gifts in service to the church rather than academy. He is the director of Perichoresis Ministries an international ministry which proclaims the gospel of the Triune God. In many ways Kruger’s emphasis in theology dovetails well with The Shack making this a good vehicle to proclaim his Trinitarian theology. The Shack Revisited divides into three parts. In part one, Kruger explores the image of Papa in The Shack. He gives a good apology for Young’s depiction of the Father as an African-American woman. God defies the images we construct of him and pastorally, this sort of revelation of God was exactly what Mackenzie needed. In part two Kruger widens his theological circle to reflect on the nature of the Son and the Spirit and their relationship with the Father. Like Young, Kruger eschews any hint that Jesus died to appease the wrath of the Angry God; Rather, the Trinity acted in Christ to restore those of us who were lost and broken. He quotes extensively from the novel and praises Young for the way he depicts the Spirit and the way the Godhead relates to one another. In part three Kruger expounds on ‘Papa’s Dream’–namely, our full inclusion and participation in the life of the Trinity. but it remains a concern for me. Kruger doesn’t make much mention of this aspect of the novel. Other’s will be bothered by Kruger’s and Young’s inclusivism. For both these authors, every person no matter how twisted and broken, somehow participates in the divine life of the Trinity and are ultimate recipients of Jesus’ saving work on the cross. With all the hoopla these days about universalism, this will remain a sticking point for many readers. For my part, I enjoyed this book but found it slow reading. Kruger uses the story of the Shack as a springboard for theological reflection. That means he swings between describing pieces of the story and the characters, quotations and his own theological musings. This book made me want to read another book by Kruger and perhaps The Shack again, although it may be a while be for I revisit these pages. I give it 3 stars. Disclosure of Material Connection: I received this book free from the author and/or publisher through the Speakeasy blogging book review network. I was not required to write a positive review. The opinions I have expressed are my own. I am disclosing this in accordance with the Federal Trade Commission’s 16 CFR,Part 255. While I have had opportunity to review Christian fiction in the past, I haven’t until now. I have my reasons. I don’t think that all Christian fiction is bad, I sort of put it in the category of ‘church coffee.’ You might get a decent cup of coffee after a church service, but you can’t expect it and the odds are your next couple will be god-awful (that is the technical term). I also am just not that into Amish Romance or whatever the kids are reading these days. Why I am I so biased against religious fiction? Well I think the problem is that the genre category means that it is usually written with either didactic or apologetic intent (to teach you something or to stylistically vomit the gospel on you). This sometimes means that there is a compromise in the artistic integrity of Christian novels (but yes there are also good ones). But despite my biases and suspicions I liked Hometown Prophet a lot. The premise behind the story is this: Thirty-something Peter Quill moves back home to Nashville to live with his mom. He begins receiving prophetic dreams where he correctly predicts the future. Soon the visions he has put him at enmity with the Christian community in Nashville, especially when he calls into question people’s economic and ecological commitments and challenges them to regard Muslims as their neighbors. Author Jeff Fulmer describes how he grew up in a conservative, charismatic household but became increasingly ill-at-ease with how Christianity was misrepresented ‘for personal and political gain.’ He wrote Hometown Prophet out of that frustration. But while this book is a book with a message, it doesn’t strike me as overly preachy. The main character, Peter Quill becomes increasingly confrontational in his prophecies and says a lot of things really strongly. Fulmer balances this by describing Peter’s inadequacies and shortcomings. He is a complex character, and the story is well crafted. In this book Fulmer challenges us to pay attention to those around us, to love our neighbors as ourselves and to look for creative ways for God to use us (even if we never hear a prophetic word). People on the far right may be challenged and offended by elements of this story, but I think challenge is good. This is a fun read which I recommend. Now if I could just get some decent church coffee. If you don’t think that monsters are a big deal, you need not look any further than the Young Adult fiction section of your local library, prime time television or anything Twilight related. Everywhere you turn there is some fabled beast slouching toward Bethlehem. So it’s not surprising that Christian publishers have gotten into the mix (besides this book I can think of two other recent publications which explore the theme). Matt Mikalatos has written an interesting book about Spiritual transformation using ‘monsters as a metaphor for our Spiritual maladies. Without giving the whole plot away, here is the basic premise: Matt, as the self-appointed and sole Neighborhood Watch patrol person discovers the existence of monsters in his neighborhood when he comes upon a Mad scientist (eccentric genius) and a robot (ahem…android). The mad scientist’s experiment is supposed to repel and cure werewolves but instead sends a werewolf and zombies streaking through the neighborhood. 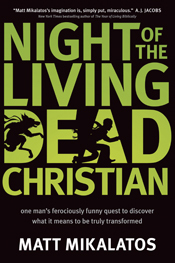 Matt joins forces with the mad scientist and robot to capture the werewolf (who is a Lutheran non-Christian named Luther Martin) who happens to be a neighbor. Their capture attempt fails but the three of them try to help Luther cure himself from being a werewolf. There attempts bring them into contact with a church full of zombies, an (almost)ex-vampire who Matt went to high school with, and horror of horrors, a psychologist. So there you have it. Admittedly I was disappointed that though the title eludes most specifically to zombies, they are not the focus of the narrative (though certainly significant). The story instead focuses mostly on the werewolf, but the monster phenomenon in general. Mikalatos is interested in what the monsters tell us about our sinful, fallen nature. This isn’t novel to him, most great monster literature from Dracula, Frankenstein to Dr. Jeckle, Mr. Hyde reflect on human nature and the inner psychology of the monster. What Mikalatos does is explore the theme from an explicitly Christian perspective. The central theme of this book is that our own monster-like-tendencies are only overcome through a transforming encounter with Jesus Christ. This is good theology. It is only through Jesus that we are fully human (though the second Adam, he is the prototype of the new Humanity of which Adam is merely a Type). There is even a self-diagnostic inventory at the back of the book, so you could discover your own monstrous tendencies (or more likely just diagnose your friends). But is it good fiction? Well I doubt Mikalatos will win any literary prizes this was a fun, and insightful read (in real life Mikalatos works with college students so he may have more experience with monsters than most of us). I found myself wondering at one point if the Matt Mikalatos in the story (he is a character in his own novel) had a job because he seemed to be free to just drop everything and give copious amounts of time to hunting and helping monsters. Oh well, the whole plot of the book strains credibility but it doesn’t take it self too seriously. Mikalatos fills it with self-effacing humor keeping the tone light. SPOILER: One thing I really appreciated was the fact that Luther Martin is transformed at the end of the story, doesn’t mean that his life was necessarily easier to deal with. It would have been easy to spin this into a self-help, over come your inner demons and succeed in life sort of narrative. Mikalatos doesn’t do that, but is true to how difficult the Christian life remains for those of us who have experienced real transformation. Tyndale Was gracious enough not only to provide me a copy of this for review, but is allowing me to offer this book as a giveaway prize. If you are interested in receiving a copy of this book, comment below (you may want to tell us what sort of mythical monster you most relate with).